This pancake recipe is fairly kid-friendly, except for the hot griddle. 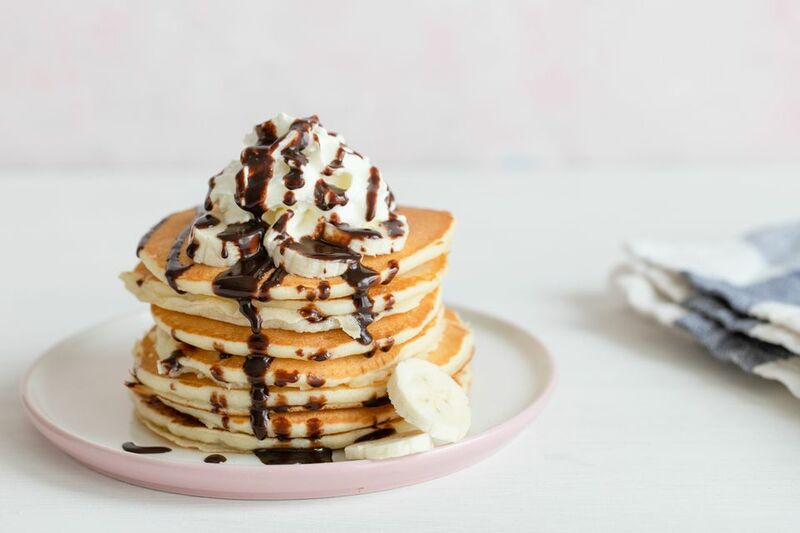 Kids can mix the ingredients together and the adult(s) will have to oversee the use of the griddle and give some instruction on pancake flipping. Otherwise, this is a great recipe to get your kids involved with for preparing breakfast. You will be building skills and cooking competence while also making family memories. Your child might even propose making pancakes for dinner. It may be a new interest that they'll take up and look forward to doing with you. Discuss what toppings will be used, from good old butter and maple syrup to fruit toppings or even peanut butter. For kids who are just learning to flip pancakes, a griddle is recommended over a frying pan. Instructions are given for both methods. Before you start, make a point of washing your hands and those of your child before you touch the clean utensils and ingredients. This will be a good life skill to cultivate. In a large mixing bowl, add all dry ingredients (flour, baking powder, sugar, and salt). Hollow out a place in the center of the dry ingredients. Pour the butter, milk, egg, and vanilla in center of dry ingredients. Using an electric mixer, with adult supervision, mix on low until all ingredients are well mixed. Use a spoon to scrape the remaining flour from the side of the bowl. Spray the griddle with cooking spray. Preheat an electric griddle to 300 F. For a stovetop griddle use medium-high heat. Fill a ladle half full with batter and slowly pour it on griddle. Repeat, leaving plenty of space between pancakes for easy flipping. When pancakes are filled with small bubbles, gently slide a spatula under the pancake and flip. Cook for another 30 to 45 seconds and use spatula to lift off the griddle. Serve the pancakes with your choice of whipped cream, strawberries, blueberries, bananas, chocolate sauce, maple syrup, or butter. Leftover pancakes should be wrapped in plastic or placed in an airtight container and stored in the refrigerator. They can be reheated in the microwave to enjoy within three to four days. Make the cleanup part of the cooking process. The mixing bowls, measuring spoons and mixer blades should be rinsed as soon as possible so the batter doesn't harden. They can be washed thoroughly after the meal. Important: While this "Kids Can Cook" recipe is written with kids in mind, it is not necessarily meant for kids to make without adult help. Kids' ages and level of cooking knowledge will affect how much help they need in the kitchen. Kids should always ask their parents before cooking anything.